TB-125 Torch Boosters are for the mid-sized jewelry manufacturer with up to 25 bench torches and/or a single large casting torch, such as a Harris Melting Torch with 30N tip. The TB-125 system supplies 125 cubic feet of natural gas per hour at 25 psi. The system includes a 3/4” shutoff valve and 5’ flexible stainless steel hose for easy connection to the utility natural gas pipe. 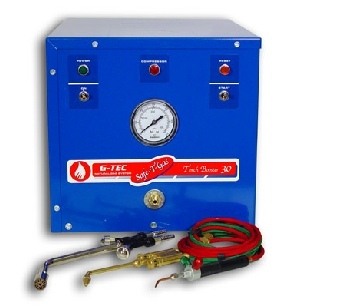 On the high-pressure output side our regulator lets you set pressure between 5 to 15 psi and a “B to ¼ NPT Adapter” makes it easy to connect the Torch Booster to the manifold supplying natural gas to the jewelers’ benches. One-year/2,000 hour parts and labor warranty. Read G-TEC’s warranty. Read sales terms and conditions. Shipping from Buffalo, NY is an additional charge. Sales tax is charged for deliveries in New York State. The TB-15 Torch Booster is the right Torch Booster for a jeweler using 1 or 2 bench torches and who does not do any casting. The system supplies 15 cubic feet of natural gas per hour at 25 psi. The system includes a 1/2” shutoff valve and 5’ flexible stainless steel hose for easy connection to the utility natural gas pipe. 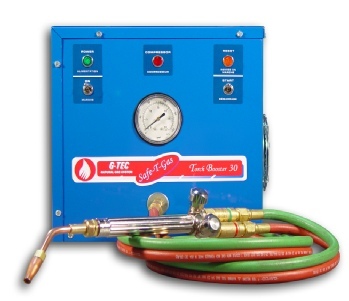 On the high-pressure output side our regulator lets you set pressure between 5 to 15 psi and a “B” to 1/4 NPT Adapter” that makes it easy to connect the Torch Booster to the manifold supplying natural gas to the jewelers’ benches. One-year parts and labor warranty. Read G-TEC’s warranty. Read sales Terms & Conditions. Use your Discover, VISA, MasterCard or American Express card to purchase your TB-15 Torch Booster. New York State sales tax and shipping are an additional cost. Use your Discover, VISA, MasterCard or American Express card to purchase your TB-30 Torch Booster. New York State sales tax and shipping are an additional cost. Use your Discover, VISA, MasterCard or American Express card to purchase your TB-60 Torch Booster. Use your Discover, VISA, MasterCard or American Express card to purchase your TB-125 Torch Booster. Use your Discover, VISA, MasterCard or American Express card to purchase your TB-250 Torch Booster. TB-500 Torch Boosters are for large jewelry manufacturers with up to 75 bench torches and/or three large casting torches, such as a Harris Melting Torch with 30N tip. 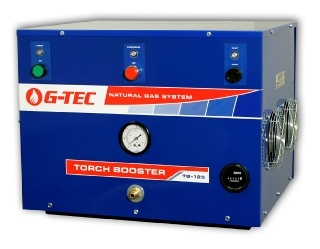 The TB-500 system supplies 500 cubic feet of natural gas per hour at 45 psi. The system includes a 3/4” shutoff valve for use at the point of connection with the utility gas pipe, a regulator to set pressure between 5 to 15 psi and a “B to ¼ NPT Adapter” to make it easy to connect the Torch Booster to the manifold supplying the jewelers’ torches. Use your Discover, VISA, MasterCard or American Express card to purchase your TB-500 Torch Booster. 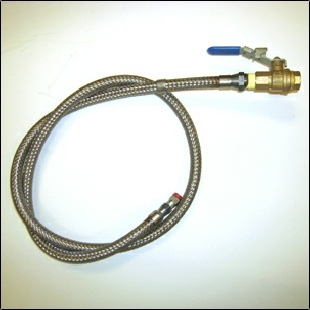 A 5’ flexible stainless steel hose with a shutoff valve connects the Torch Booster to your utility natural gas pipe. This hose is approved and required by NYC Department of Buildings. Fire Dept. 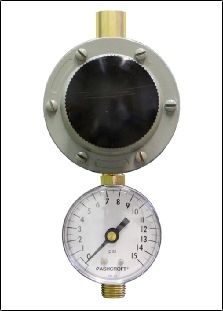 Rule 2609-01 requires that gas pressure to the torches cannot exceed 15 psi and this regulator insures that your system complies with this rule. When connecting a Torch Booster to a manifold plumbers and contractors sometimes have difficulty connecting to the reverse “B” thread on a regulator or flashback arrestor. This adapter is a female “B” thread on one side and a 1/4” female thread on the other making connection to a manifold easier by providing the proper thread to each end. 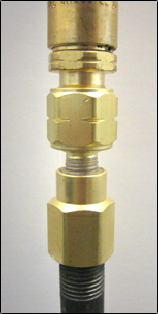 This adapter is available in a model for natural gas (the thread is reversed) and oxygen. This adapter must be ordered - it is not automatically included with the TB-15 System. This adapter must be ordered - it is not automatically included with the TB-30 System. This adapter must be ordered - it is not automatically included with the TB-60 System. The TB-60 Torch Booster is the right torch booster for a jeweler using up to 12 bench torches or who does frequent casting with a smaller torch. Jewelers using a large casting torch such as a Harris 30N tip should purchase the TB-125 Torch Booster. The TB-60 system supplies 60 cubic feet of natural gas per hour at 25 psi. This adapter must be ordered - it is not automatically included with the TB-125 System. TB-250 Torch Boosters are for large jewelry manufacturers with up to 40 bench torches and/or two large casting torches, such as a Harris Melting Torch with 30N tip. The TB-250 system supplies 250 cubic feet of natural gas per hour at 45 psi. The system includes a 3/4” shutoff valve for use at the point of connection with the utility gas pipe. On the high-pressure output side our regulator lets you set pressure between 5-15 psi and a “B to ¼ NPT Adapter” makes it easy to connect the system to the manifold supplying the jewelers’ torches. insures that your system complies with this rule. The TB-30 Torch Booster is the right torch booster for a jeweler using up to 6 bench torches or who does occasional casting with a small torch. The system supplies 30 cubic feet of natural gas per hour at 25 psi. 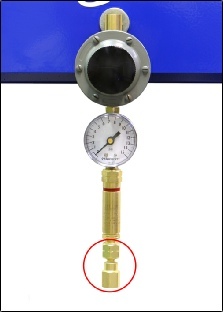 On the high-pressure our regulator lets you set pressure between 5 to 15 psi and a “B to 1/4” NPT Adapter” makes it easy to connect the Torch Booster to the manifold supplying natural gas to the jewelers’ benches. One-year parts and labor warranty.Read G-TEC’s warranty. Read sales terms and conditions.